Weekly Oracle Card Reading for the week September 9 through 15. This week the reading is from the Goddesses Oracle Cards Deck by Doreen Virtue . BlogTalk Radio Show September 7, 2013 available on archive or iTunes at Lets Ask the Angels. This week’s reading has to do with you owning your personal power in relationships, expressing yourself as leader and staying in touch with balance of work and play. You will be supported in your relationships and guided to be centered and focused on creating balance in your life. For Monday and Tuesday we have the legendary Celtic Goddess, ISOLT. Isolt dealt with a tragic love triangle between her husband King Mark of Cornwall and her profound love for another, Tristan. 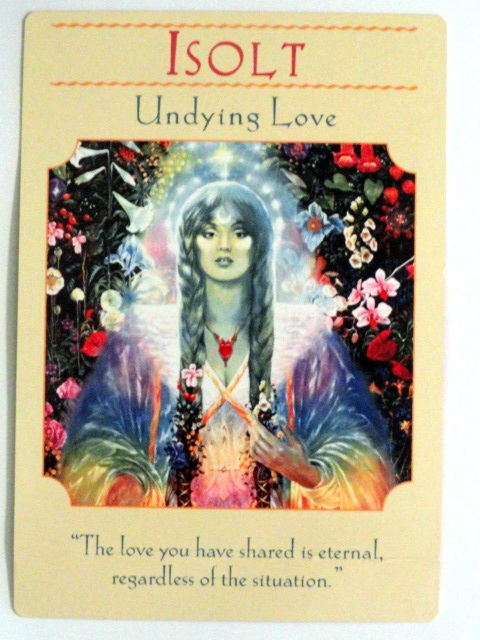 The message is Undying Love-The love you shared is eternal regardless of the situation. Isolt can help us with any relationships issues including love, family, romantic, parental, or friendship. She is reminding us regardless of the situation- our love is real, powerful, and undying. You can call upon Isolt whenever you need support with any relationship, including your connection with departed loved ones. You may have had a situation with a relationship that did not turn out the way you expected. It may have ended in a disagreement or a difference of opinions or even a break up. Nevertheless the hurt you felt is real and may take time to heal. The pain may even cloud your ability to feel peaceful and centered. Isolt can aid us in getting back on our feet. She is found in Nature so try to spend time outdoors among the flowers and trees and even with animals. This can be very healing and restorative. She is letting us know that our love with someone will never die even though our relationships may change. On Wednesday and Thursday we have DAMARA, a Celtic fertility goddess whose name means ‘gentle’. 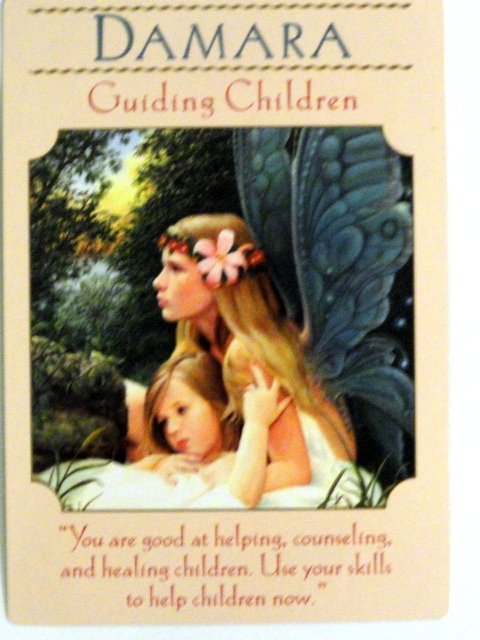 Her message is Guiding Children: You are good at helping, counseling, and healing children. Use your skills to help children now. She supports us to be peaceful an in harmony with our families and friends. She allows us to stay in touch with our vulnerability and faith. Damara can direct us with respect to the best way help children- yours or someone else’s. She says do not suppress yourself! You have the skills and qualities to help many young people. You have Damara’s support and guidance to express yourself and trust that what you have to contribute makes a huge difference for them and the planet. You may have a life purpose that involves them.You may also be an Indigo committed to children and their safety and health. On Friday, Saturday and Sunday we have the Egyptian Goddess, Bast. Bast transforms into a cat each night and protects her family and those who call upon her with her all seeing eye night vision. She helps us be in touch with our own catlike traits including gracefulness, independence, playfulness,and intuition. Bast also works with cat lovers to help their feline companions. The daughter of the sun god Ra, Bast has the rare distinction of being both the moon and sun goddess. 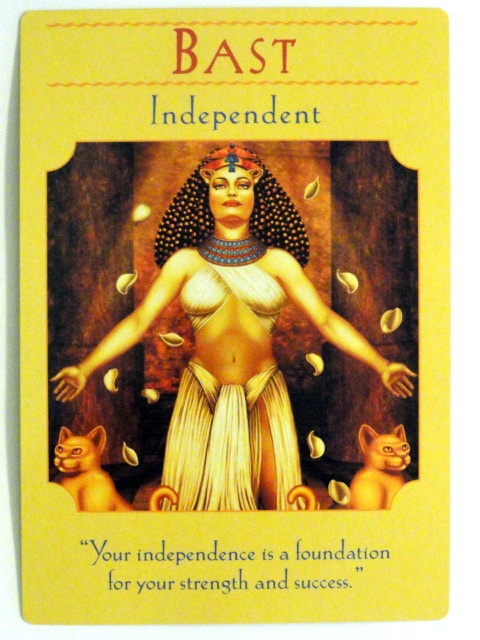 Here her message is be Independent: Your independence is a foundation for your strength and success. Like the cat, you’re fiercely independent, yet you also need affection and playful companions. Now is the time to balance your social interactions with solitude. While you may ask others for their opinions, ultimately you must make your own decisions. Your freedom and independence are top priorities, so ensure that these characteristics are nurtured. Spend time alone. Give yourself permission to play. Ask for your needs to be met. Make your own decision.